When we become ill, it’s often because our immune health is suffering. Our Portland naturopathic doctors understand that the body has an incredible ability to heal itself—unless its vitality is blocked or out of balance. Supporting the immune system is a natural medicine practitioner’s first priority. Did you know that stress is a top threat to women’s immune health? In fact, 90 percent of primary care visits are stress related. Of course, there are the external threats as well, such as smoking and chemical contaminants. Caregiving is also a factor in compromised immunity. Eight in 10 caregivers have chronic illnesses and 66 percent of caregivers in the Unites States are women. Stress from caring for a sick or elderly relative increases the odds of becoming chronically ill.
We invite you to learn more about the common threats to women’s immune health and how the body responds to these threats. 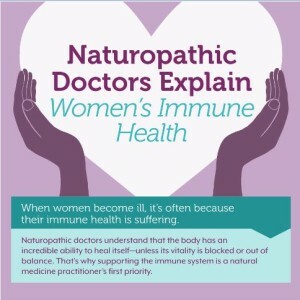 This entry was posted in Allergies, Immunotherapy, Infographics, Naturopathic Physicians, Portland Natural Medicine, Womens Health and tagged natural medical care in portland, naturopathic clinic in portland, naturopathic doctors in portland, portland natural medicine, portland naturopath, portland naturopathic clinic, portland naturopathy, womens health portland.